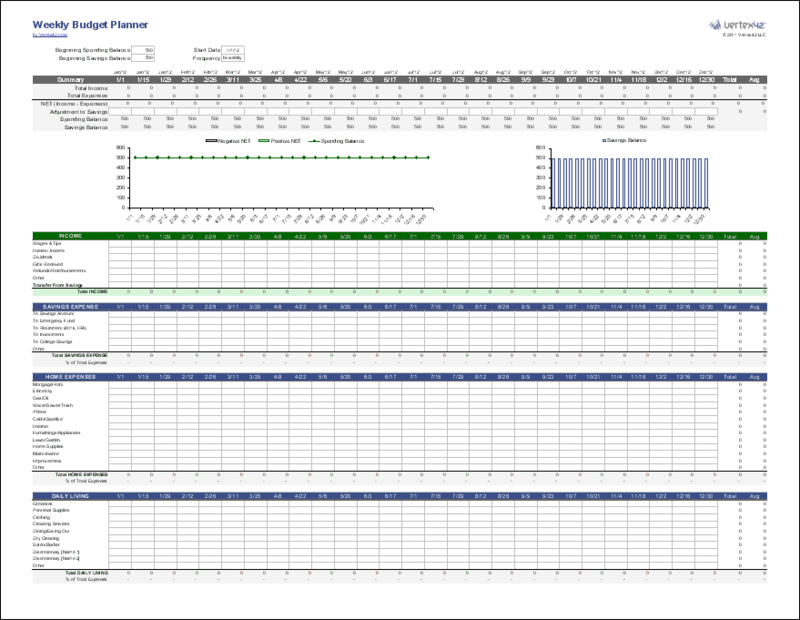 Budget weekly or bi-weekly using these new templates for Microsoft Excel®. Many people like to budget based on their weekly or bi-weekly paycheck, so I've created two weekly budget templates designed for that purpose. The first template is a weekly money manager that allows you to track accounts and record transactions and compare your spending to your budget (all in a single worksheet). The second is a multi-week budget planner that can help you analyze and plan for future expenses and cash flows. These weekly budget templates are a fairly new addition to Vertex42.com. So, if you have comments or questions about them, please go to the following blog post to give feedback or ask your questions. This template works for a weekly, biweekly, or monthly budget. Like my original Money Management template, you can customize budget categories and track multiple accounts, but this version includes everything in a single worksheet and uses fewer budget categories. Although it lacks some features of the original template, I designed it to be easier to use (requiring very little Excel experience). 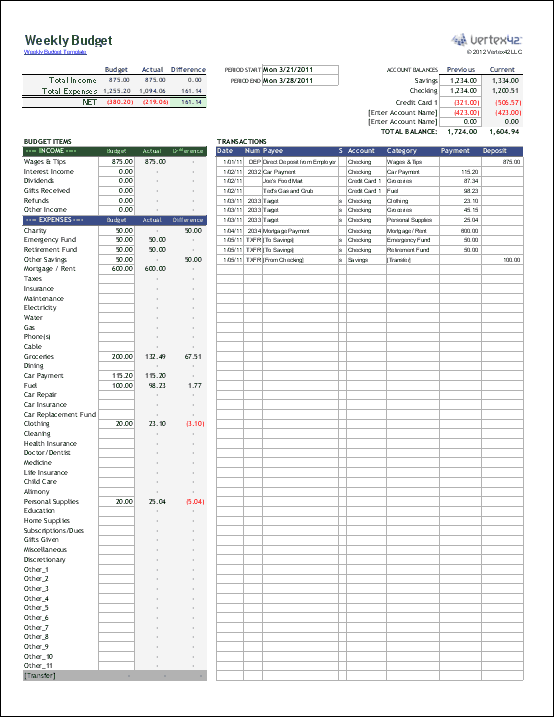 You can make a copy of the budget worksheet for each budget period. The main disadvantage of this approach is that your transaction data is split across multiple worksheets, making it more difficult to create yearly reports. This template is great for when you are first learning to budget and track your money, but it's easier to do more detailed analysis if your transaction data is in one register, like in the original Money Management template. Update 10/5/2017: I added help content to the .xlsx version of the template, mostly explaining how to enter different types of transactions (transfers, credit card payments, savings allocations, etc.). This is a weekly or bi-weekly version of my Family Budget Planner. Almost everything else is exactly the same as the family budget planner. The main difference is that more columns have been added and labeled with the date of the week.